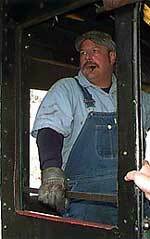 Hoyt Schoonover, conductor on the Virginia & Truckee Railroad. 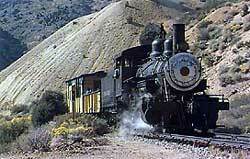 The V&T was built in 1869 to connect Virginia City with the Carson River valley. By 1874 the "Queen of the Short Lines" had been extended to Reno and as many as 50 trains carrying passengers, supplies and ore traveled through Virginia City every day. 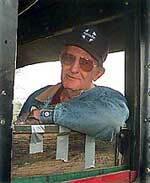 Bob Horton was an engineer with Santa Fe for 43 years in New Mexico. He has been the principal engineer of the V&T for the last two years. "This locomotive is oil-burning, some steam engines still burn wood or even coal, and she really works going up the 4-1/2% grade. Our top speed is about 10 miles per hour, but on a flat grade we could do about 50 to 55." Hoyt narrates the trip from the caboose, which is 72 years old. Along the way he points out the exposed silver ore along the track, and occasionally passengers see some of the wild mustangs that roam free in the surrounding Flowery Mountain range. 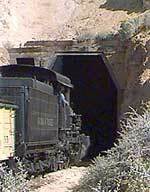 The train's route takes it through Tunnel Number Four, which is one of the six tunnels constructed to allow the trains to descend nearly 1600 feet from Virginia City to the valley floor. The fireman of a steam locomotive regulates the water and fire box to ensure that the engineer has the right amount of steam pressure to drive the engine. 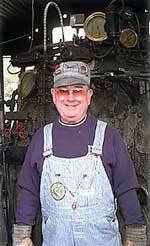 Ed Gallegos has spent the last 24 years working with steam engines around the west. A series of valves and gauges allow Ed to alter the fuel mixture to increase or decrease the oil which in turn produces the steam. Ed is a busy man keeping everything in order, especially on steep climbs. He also rings the bell at road crossings. Fourth Ward School, seen from the fireman's window, is the first signthat the engine has just about completed another successful pull up the grade. 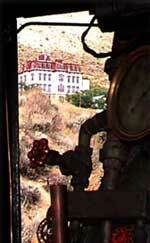 Soon Bob will be tooting the train's whistle to announce another arrival of the V&T in Virginia City!